When Texan Governor Rick Perry made intimations of a call to sovereignty for the state he represented, provoking an echo of “Secede!” from his audience, his words seemed as absurd and contrived as much of the Tea Party spectacle which they attended. What’s unfortunate is that their out of hand dismissal only helped to further an illusion which keeps us all deprived of a wealth of North American history, and also dangerously unaware of the multiplicity of social fractures which may as yet manifest in new forms of nationalisms. North America is not nearly as static, nor as united as it would appear. In fact, it is a highly unstable collective of fractal nations, operating as 3 larger entities mostly by force of economics and physical repression. At this moment there are militant separatist and sovereigntist movements in Mexico, the US and Canada, many initiated by indigenous groups, but some by settler communities, former states, or quasi-utopians. In fact, the North America as it appears on a map is nowhere near the truth. The truth is a land divided by physical and imaginary boundaries, some based on the very real past, and others on visionary projections into the future. These micro-cosmic reproductions of the platonic Republic that the United States would have us believe is in existence may not yet form, but they exist in the psyche of the people who live there, and in the near history that lives on in names, documents, and idiosyncratic expressions of popular culture. Look no further than Texas, only a United State since 1865, and follow its Republican lineage to get a glimpse of the complexity, or the swamp, that is North American politics, identity, and culture. Video borrowed from Fox news. 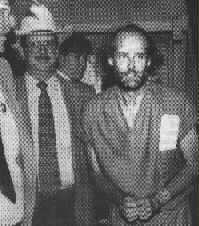 Rick McLaren was a leader of the contemporary Texan Independence Movement. The TIM believes that the Republic of Texas was illegally annexed into the United States and is currently under occupation by foreign rule. He and his “terrorist” organization were involved in kidnappings, fraud, and attempts to assassinate President Clinton. The Texan Independence Movement has fractured into several organizations since the arrest of McLaren and others, though it continues to organize and meet today. Photo borrowed from Pecos Enterprise. 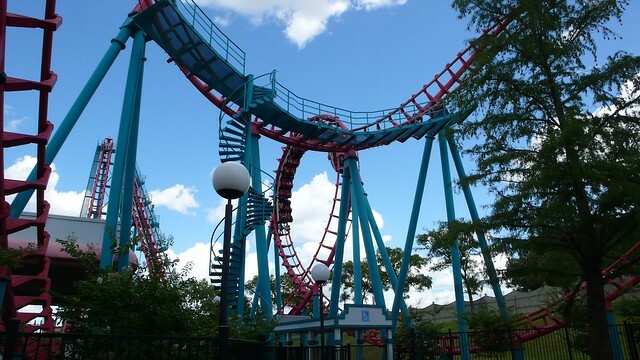 Texas flies six flags with pride, over government buildings and in public spaces, each a nation which Texas has been a part of. Those nations include Spain (1519–1821), France (1685–1690), Mexico (1821–1836), the Republic of Texas (1836–1845), the Confederate States of America (1861–1865), and the United States of America (1845–1861; 1865–present). “Giant” by LLudo (2008). Photo borrowed from LLudo. On February 1, 1861, Texas seceded from the Union and fought alongside the Confederate States for independence from the United States of America. Texas rejoined the Union following the cessation of conflict in 1865. In the 1869 court case Texas vs. White, it was determined that under the law of the US Constitution, the Union was perpetual and indestructible, and not the voluntary compact between sovereign states. In other words, it was illegal – impossible – for a state to unilaterally secede, and there-fore Texas had never stopped being a State. History is not the only thing written by the winners. 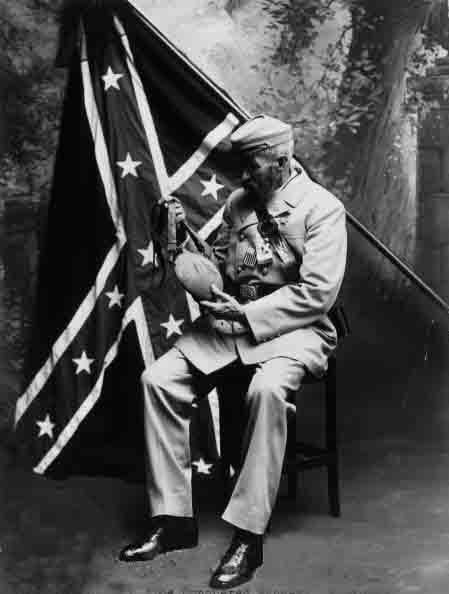 Photo of a black Confederate soldier borrowed from Texas Confederate Veterans. Before a formal plan for revolution could be implemented, in accordance with Santa Anna’s nationwide call to disarm state militias, Colonel Domingo Ugartechea, who was stationed in San Antonio, ordered the Texians to return a cannon given to them by Mexico that was stationed in Gonzales. The Texians refused, suggesting that the Colonel “come and take it”. The Republic of Texas declared independence from Mexico and claimed territory extending to the Pacific Ocean. Internally they were divided between those wishing to build and expand and independent nation and those who argued for peace with indigenous nations and eventual union with the united states. Eventually, in the wake of grueling wars with Mexico, the Comanche and other tribes, the indebted republic negotiated a near unanimous vote to join the Union. Designed by David C. Treibs (1994). Image borrowed from Come and Take It. The Republic of the Rio Grande was a name claimed by insurgents against the Central Mexican Government who sought to establish it in northern Mexico. The Republic’s capital was Laredo, which still flies the Republic of the Rio Grande’s flag in among the traditional Six Flags of Texas (see photo, second from left). 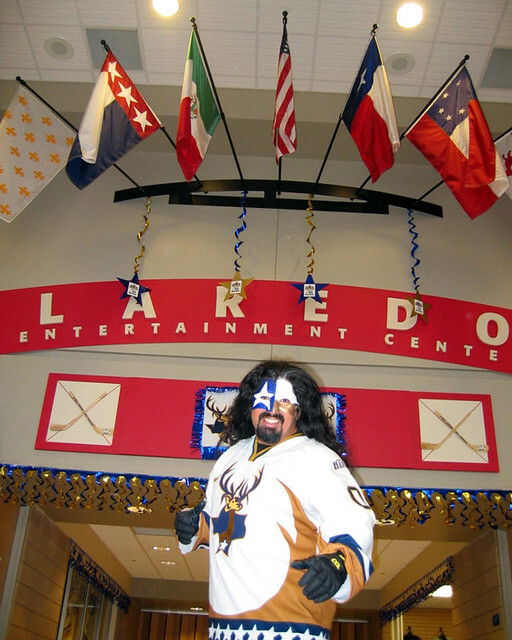 The Laredo Entertainment Center by John Gamez, aka Flagman (2005). Photo borrowed from Flagman. Settlers declared independence from Mexican Texas and created the Republic of Fredonia near Nacogdoches, Texas. The Republic formed December 21, 1826 and was dissolved January 31, 1827. Agustín Cosme Damian de Iturbide y Arámburu, a member of a highborn Basque family, fought for the Royalist Cause, intitially opposing the insurgency against Spanish Rule, and ultimately aligning with the class interests of the Mexican-born Spaniard aristocracy in militating for Mexican Independence. After initially leading as the Emperor of Mexico, Agustín I abdicated his throne and entered into exile in the face of political pressures. He attempted to return to a still struggling Mexico to carry on as it’s popular leader but was intercepted by conservative military forces, tried and executed. The East Texas missions were a direct response to fear of French encroachment when the remains of La Salle’s Fort Saint Louis were discovered near Matagorda Bay in 1689. They functioned as an integral part of the genocidal process of colonization, under the pretense of Christianizing the Native population. 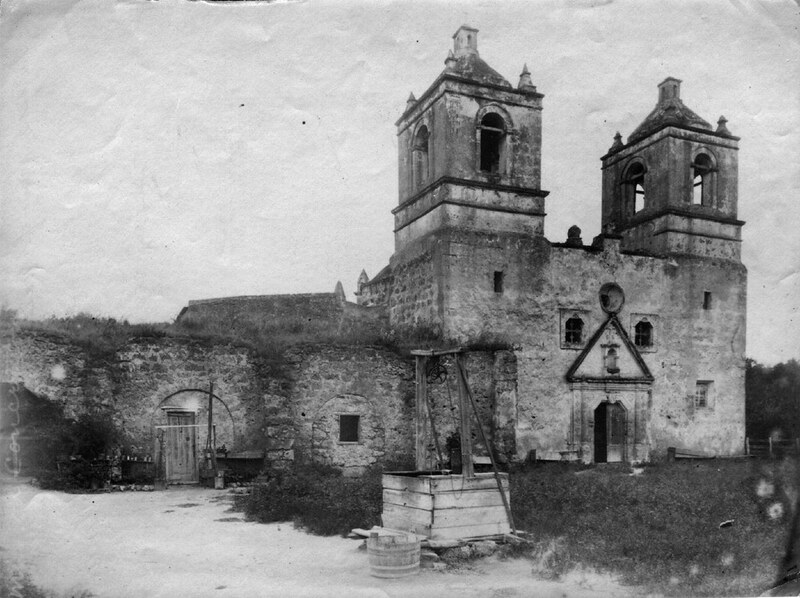 Later, the Missions would often become bases, hiding places, and public offices during Texas’ many republican wars. Photo of photo by George E. Burr by Garth Davis. Burr photo taken as the official photographer of President Harrison’s pacific coast trip of 1891. Of the nearly 300 people who sailed with La Salle, only 15 or 16 people survived the colony. Six of them returned to France, while nine others were captured by the Spanish, including four children who had been spared by the Karankawa’s. Map public domain. The map was included in Relacion y Discursos de Descubrimiento, written by Alonso De Leon in the 1690s. It is reprinted in From a Watery Grave: The Discovery and Excavation of La Salle’s Shipwreck, La Belle by James E. Bruseth and Toni S. Turner (2005), Texas A&M University Press. the outset there was fierce resistance to the invading forces of France and Spain, and eventually Texians and Americans. Some, such as the Karankawa and the Dotchetonne are extinct, or else their remaining descendants were absorbed into the Hispanic populations living in the south Texas region, as was the case with the Coahuiltecan. Most indigenous nations formed treaties, fought in various wars for and against various republics, but were ultimately betrayed, their land being stolen, their cultures taken away, and their ever shrinking population relegated to small reservations. Some are still in Texas, while others, such as the Caddo Nation, were forced into Oklahoma which was once the independent Indian Territories. 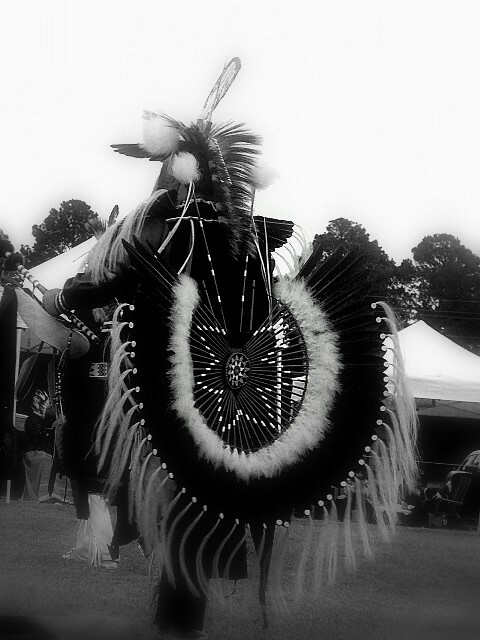 The Caddo Nation is comprised of the Haisinai, the Kadohadacho and the Natchitoches. The Haisinai lived in the land from Nacogdoches, Texas, which was originally a Caddo settlement area, to the Neches River. The Haisinai were given the name Tejas by Spanish explorers, based on the Caddo word táy-sha? – “friend” – and this later became the source of the regional name of “Tejas” and later “Texas”. The Kadohadacho settled the land from the Caddo Lake area to the Red River. 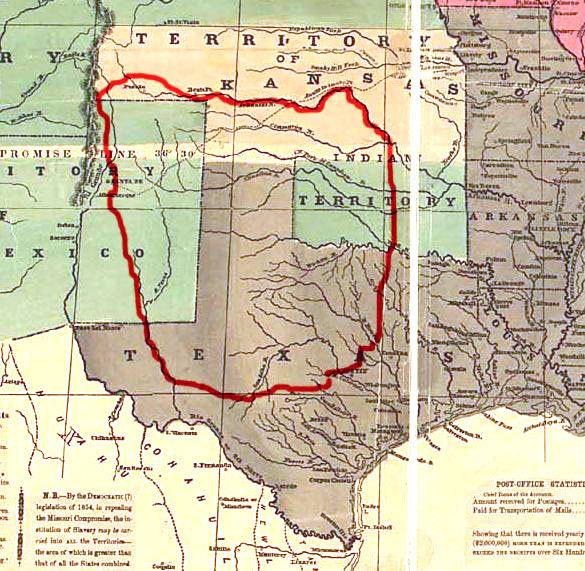 In 1859, the state of Texas removed the remaining Caddo from its territory to a reservation in Oklahoma. caddo dancer by katlyn.monster (2005). Photo borrowed from katlyn.monster. 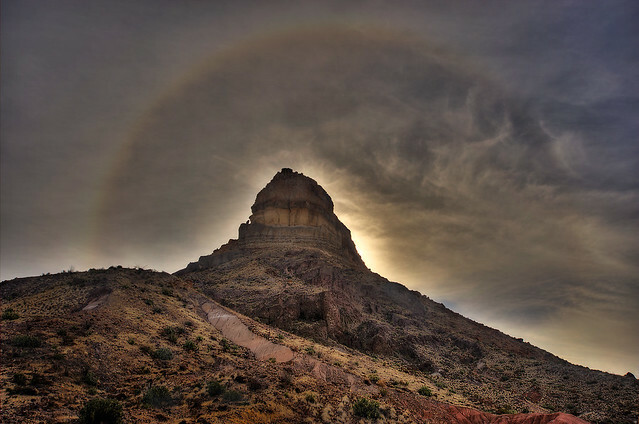 Big Bend by Louis Vest (2009). Photo borrowed from OneEighteen. “Esta foto la tome en el Puente de regreso de El Paso a Juarez, durante la visita del sup Marcos, como parte de La Otra Campaña. La subo tambien como parte del Grupo 50mm de Pozotecnico, para ejemplificar el Modo Deportivo. Es casi igual que la anterior… pero esta mas cerca. En el Puente, con la otra by Alex Briseño (2006). Photo borrowed from Alex Briseño. Satellite image of north America borrowed from Weather Central.